Every now and then an injury requires some convincing to heal. Especially those injuries that include splinters, boils, or bug bites. 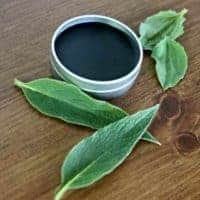 Do that and convincing with an easy and natural homemade herbal drawing salve recipe. We are active people, we use our hands often and don't wear gloves as much as we should. This is especially true when we're working with the wood we use to heat our home. We chop, stack, carry, fill the woodstove, etc. All that working with wood means we get slivers and splinters. Generally, we're able to get those removed with tweezers but occasionally the little ones need a little convincing. I know we're not alone in that. I convince those stubborn buggers with this homemade herbal drawing salve. This salve whips up in less than an hour. Unless you're making some for gifts, one batch should be enough to last a year. As all oils can go rancid, do use this salve up within 1 year. 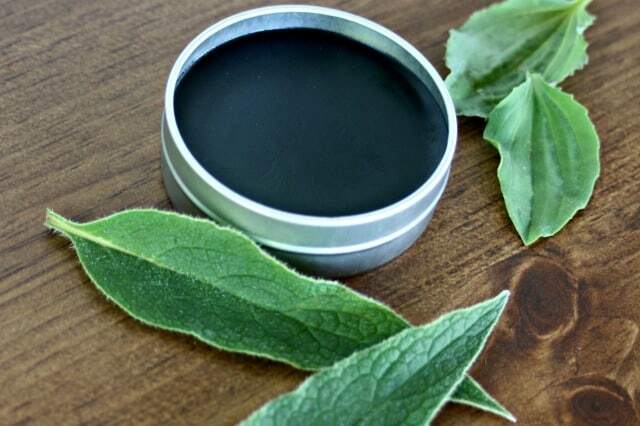 Comfrey is an astringent that can help heal minor wounds, ease inflammation, and lessen scarring making it an ideal herb to use in a drawing salve. Plantain can help with itching and sting. It also has some ability to draw out infection. 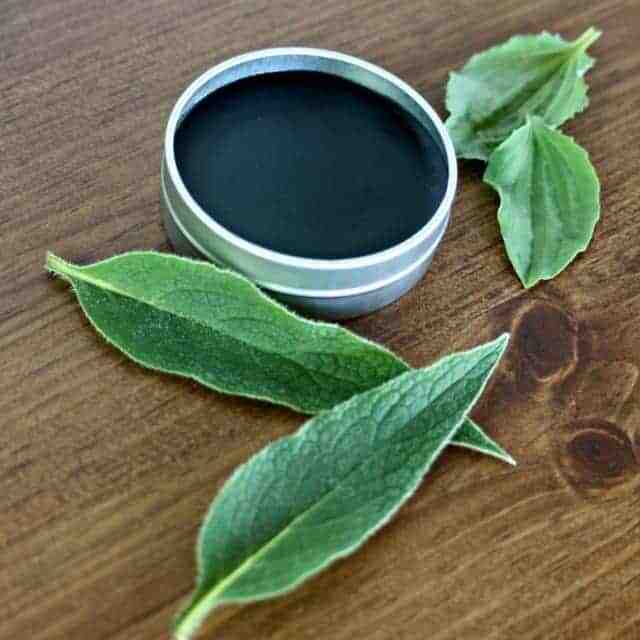 Activated Charcoal has been used to remove toxins from the body. Medical doctors often use it in cases of poisoning. When applied to the skin, it can pull toxins from the pores and that same action seems to help with splinters and slivers in our experience. Kaolin Clay is gentle, has disinfectant properties and can stimulate circulation which can help speed healing. Tea Tree Oil has antibacterial properties and can speed healing. 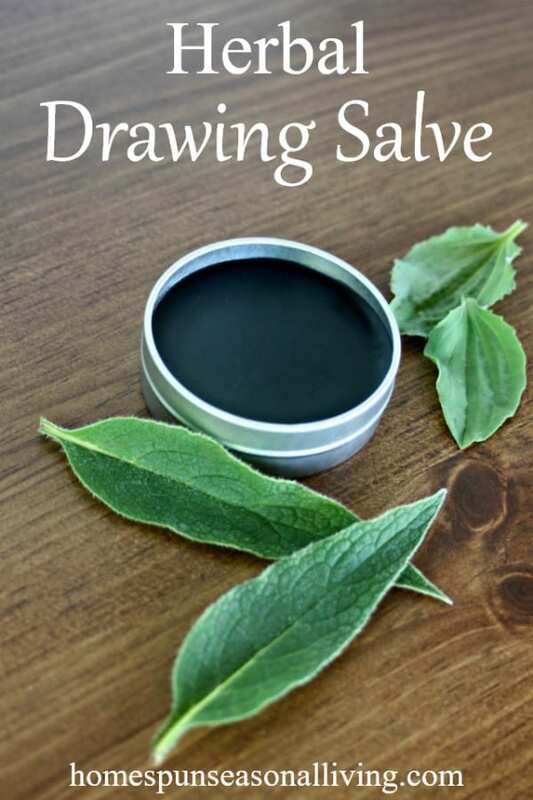 Get rid of splinters, slivers, stingers, and more from the skin by learning how to make a homemade herbal drawing salve with this simple recipe. Combine the chopped comfrey and plantain with the oil in the top of a double boiler. In the bottom of the double boiler, heat 1" of water to boiling. Place the oil and herbs over the boiling water, keep the water simmering and heat the oil for 30 minutes. Strain the herbs from the oil and wipe out the top of the double boiler to remove any bits of herbs. Pour the strained oil back into the top and add the beeswax. Heat and stir until the beeswax melts. Remove from heat and whisk in the charcoal, clay, and tea tree oil. Stir until completely incorporated. Pour into a storage container and let harden before sealing. To Use: Spread the salve over splinters and cover with a bandage. Repeat as needed to remove the splinter. All oils can go rancid, use this salve up within 1 year. This will be such a usefull salve! We also use wood for heating and at the moment we are foraging blackberries, no matter how carefull you are you always end up being caught by the thorns. It is easy to pull the big ones with tweezers but tiny little ones are always a problem. On me or my husband we use a sterile needle to tease them out but the children are terrified by that method (wonder why ;) ) , so on them I put some healing salve I make with a plaster on top and hope for the best. It is nice to get a specific recipe to add to my herbal medicine cabinet. I hope it works marvelously for you Marie! Where do you get these ingredients. I am not a very good gardener and in fact do not know where I might find the ingredients. Are you able to use your double boiler for everything or do you own a designated double boiler for your salves ? I have never made anything like this but I know I can’t buy anything like this in a drug store. Often we need something to draw out splinters, glass , stingers ect. A local healthy food store would probably have the dried herbs and other ingredients. You could order on Amazon as well. For a double boiler, just use any pot with water in it and put another bowl that fits over the top but doesn’t sit into the water for the top portion. I have an old pot designated for this. I used a quart canning jar that sits on a jar lid (the jar then doesn’t sit on the bottom of the pot). Put water in the pot, place jar lid in pot, and jar on top of lid, and you have an easy double boiler. Less clean up, as I wipe out the jar and use it over and over. There are many types of commercial products that would do the same thing that is true. However, many commercial products contain petroleum by-products and other not always great ingredients. I am allergic to tea tree oil. What would you recommend as a substitute? Can’t wait to try this on my kids. They are constantly getting splinters and thorns but the world ends if they even see the tweezers. Use lavender essential oil instead of the tea tree oil. Woohoo, i have everything i need for this salve around the house. Great that i found your article, thank you! Yay for having everything close at hand. Enjoy! The charcoal should pull the impurities before the comfrey does its thing. At least that’s been my experience. The charcoal can in many cases work quickly. my Daughter get boils and they leave really bad deep scares on her.Can anybody tell me how to make a drowning save to help with boiles summer is coming up and she douse won’t to go thew a nouther summer with bad boils leaving deep scars. In the past I’ve used a potato with salt let it comes to a head then prickly it with a needle and let the infection run out she gets them on a regular basis and they hurt really bad.Im willing to give any thing a dry. even the old bacon fat trick douse’nt work. If any one has any ideal what , I can use please let me know thanks in advance. I wish I had really great advice but this is one of those instances where I think you might need to get to the root cause of the boils and treat that more than the boils themselves. Is there a local herbalist or naturopathic doctor you can visit for treatment? I just read in the herbal medicine makers handbook by James Green , about Burdock tonic for boils and other skin conditions. I actually make a Burdock salve every spring but have not used it for boils. And since it’s a child you would want to make this with glycerin instead of alcohol. I’ve also read somewhere about pouring water kiefer over the skin to prevent boils or staph but haven’t personally tried this. Hope this helps. Would bentonite clay be a decent substitute for the kaolin clay in this recipe? I have bentonite on hand for my homemade cosmetics and it is pretty spectacular stuff! For sure – go for it.